WHAT IS A BIOCLIMATIC HOUSE ? A bioclimatic house is an ecological house, the design and construction of which take into account the local climate and environment to reduce energy needs for heating, cooling and lighting. 50% of the windows should be south-facing. Between 20 and 30% should be east-facing. Maximum 10% should be north-facing. The hallways, stairs and entrance should be on the northern side. The living room, kitchen and bedrooms should be on the south, east and west sides. In warmer regions, bioclimatic houses require special architectural features to prevent excessive heat caused by sunlight. As such, these houses have extended eaves over southern exposed bays, awnings for the exposed bays to the east and west, windows set back into the walls and surrounding vegetation. Lastly, bioclimatic houses require optimal thermal insulation, perfect airtightness, a suitable ventilation system (dual-flow mechanically controlled ventilation). The architectural layout should if possible be compact rather than spread out. Single-storey buildings suffer less heat loss than bungalows of the same floor area. A passive house is a house that consumes very little energy thanks to its architectural design and the use of high-performance insulation. Passive houses are undoubtedly bioclimatic houses, but bioclimatic houses are not necessarily passive houses. While passive houses stay warm in winter and cool in summer, they still have heating and air-conditioning. To qualify as passive, a house must have energy requirements of less than 15 kWh/m²/year for heating. By comparison, the needs of a traditional house must be less than 91 kWh/m²/year. To foster energy savings, passive houses must have perfect insulation, maximum airtightness and use specific construction techniques. In France, passive houses are only a label as no national regulations have yet been issued. In the meantime, the rules of the German institute PassivHaus are applied. For the construction of its passive houses, TROIS DEVELOPPEMENT has chosen the construction process of POPUP HOUSE, an engineering and innovations office specialized in the construction sector. BEKOWOOD, a wood construction company and experienced master builder, has adapted this innovative process to architecture and the configuration of the plots chosen by TROIS DEVELOPPEMENT. The POPUP HOUSE construction method is based on the idea that it is more ecological, more thermally efficient and cheaper to build pre-insulated structures rather than to insulate them after construction. There are several types of foundations that can receive POPUP HOUSE structures, but TROIS DEVELOPPEMENT has opted for screw piles (TECHNO PIEUX) in order to minimize excavation work and therefore respect the natural configuration of the land for better management of rainwater. The walls and ceilings of POPUP HOUSE structures are assembled from insulating blocks separated by wooden strips. Laminated wood: Spruce wood panels composed of thin layers of wood, purged of all structural defects. They are commonly used in wooden structures requiring high performance and very high mechanical resistance. The advantages are numerous: hygrometry, uniform quality of components, high dimensional stability and material and weight savings over the entire structure. Graphite expanded polystyrene (EPS): this is one of the most efficient insulators on the market: 30 cm of EPS (the thickness of the walls of POPUP HOUSE structures) is equivalent to 37 cm of wood fibre insulation. It is lightweight and comes in the form of rigid insulation blocks. It is therefore quick and easy to install and does not shrink or contract over time. OSB: panels comprising several layers of wooden slats brace the building and make it airtight, while also providing protection against fire and water. TROIS DEVELOPPEMENT has chosen the world leader in screw piles, TECHNO PIEUX, to supply all its foundations. In addition to the quality of the steel used by TECHNO PIEUX (Canadian steel) and the flexibility of this foundation technique (suitable for all types of terrain), TECHNO PIEUX is the first screw pile foundation company to obtain a number of certifications in Canada (CCMC, CWB), in the USA (ICC-ES, ANAB, IAPMO-UES) and in Europe (BSI-CE mark, BBA, CCFAT). Since 2006, the TECHNO PIEUX technology has been covered by an approval certificate for the entire French territory. This certificate was issued by CCFAT (“Commission Chargée de Formuler des Avis Techniques” – Commission responsible for issuing technical opinions), a commission set up at the Ministry of Construction and Housing which has certified that TECHNO PIEUX piles can be used in all types of soil, as well as in regions with high seismic activity (Approval Certificate No. 3/16-873). TECHNO PIEUX is a type of screw which a special machine drives into the ground until reaching the bedrock to provide the bearing capacity required for the structure that will be placed on top of it. The piles are made of structural steel according to very specific standards (ASTM A500 grade C, CAN/CSA-G40.21-98 and CSA W47.1) and have been load-tested according to the ASTM-D1143 and ASTM-D3689 standards in several types of ground around the world. TROIS DEVELOPPEMENT pays special attention to the materials used in its constructions. Houses are delivered with oiled or varnished parquet floors containing no volatile organic compounds (VOC). The paints used are eco-labelled, i.e. they contain no heavy metals (cadmium, lead, mercury, arsenic, etc.) and their VOC content is limited to a maximum of 1g/litre. As for the structures of the houses, wood is a natural and biodegradable material and 5 to 15% of the expanded polystyrene (EPS) used in the insulating blocks of the walls, ceilings and floors of the house comes from recycled sources. Contrary to popular belief, EPS is a highly environmentally friendly material. Firstly, EPS is 100% recyclable. ESP in fact consists of 98% air and 2% material. Among these are naphtha, a derivative of the petroleum refining processes which, if not used in the production of ESP, would simply be disposed of in the ecosystem. The manufacture of ESP requires only very few natural resources. It is derived from the expansion of styrene beads, to which steam and heat are applied. The beads can reach up to 50 times their initial volume! It should also be noted that this transformation is done without solvents or glue and that the basic component, styrene monomer, is present in plants in their natural state. Another advantage is that the ESP contains no harmful gases, and its thermal performance is exceptional. It therefore helps to reduce greenhouse gas emissions. Thanks to its lightness it is easy to handle and does not require the use of heavy construction equipment. There are a large number of ESP manufacturers in France, which considerably reduces the costs associated with transport and further reduces the carbon footprint. This is aided by the fact that EPS recycling companies are usually located close to production sites. The EPS used in the structures of TROIS DEVELOPPEMENT houses is pre-cut, which minimizes wastage during the assembly process. Furthermore, our partner, POPUP HOUSE, has developed hot-wire cutting tools to reduce the amount of waste generated during cutting. Lastly, the Environmental and Sanitary Declaration (FDES) for EPS defines it as an inert material which is stable over time, non-toxic and non-polluting, and a material that does not contaminate water or soil or require special protection measures, particularly during handling. 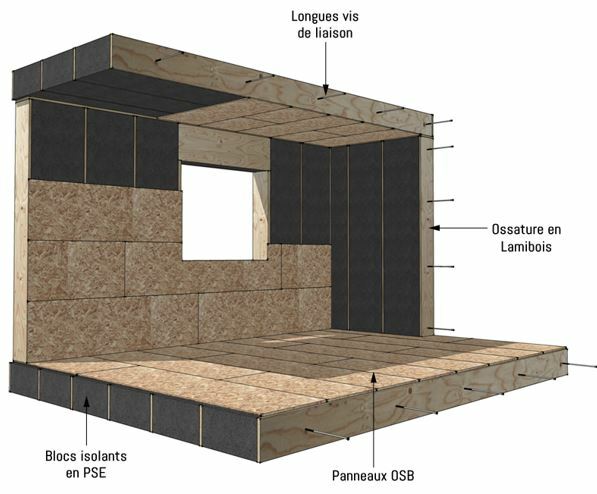 The 30 cm insulation layer in the POPUP HOUSE structures of TROIS DEVELOPPEMENT houses makes it possible to achieve very low thermal transmittance coefficients (U-values) compared to other types of construction. Very little heat passes through the walls, floors and ceilings, whether from the outside to the inside or vice versa. The U-value, also known as thermal transmittance, describes the amount of heat lost through a wall. It indicates the ability of a wall to allow heat to escape to the outside. The lower the U-value of the wall, the greater the insulation that is provided. The R-value characterizes the resistance of an insulator to the flow of heat. At equal insulation thickness, the lower the thermal conductivity, as expressed in m².K/W, the higher its thermal resistance and the better its performance. The walls, floors and ceilings of the structure are made from the same insulating material, thus preventing the appearance of thermal bridges. The POPUP HOUSE construction system used in TROIS DEVELOPPEMENT houses achieves a phase shift of about 9 hours before the interior wall reaches the outside temperature. Airtightness is provided by the OSB panels fixed to the interior of the walls. All corners of the walls and windows are sealed with sealing tape during assembly. TROIS DEVELOPPEMENT houses are twice as airtight as is required by RT 2012. This maximizes thermal performance of the houses. The houses offered by TROIS DEVELOPPEMENT are constructed using wood and graphite expanded polystyrene (EPS). Their lifespan is comparable to other traditional construction techniques but they are far more environmentally friendly ! Wood is a natural biodegradable material. Once properly dried and protected against moisture, it will last for ever! EPS is a material which has been used in construction for many years. When protected from UV rays its longevity is excellent. It is an extremely efficient insulating material that preserves its thermal qualities over time and also retains its dimensional stability, unlike mineral wool which can shrink and contract. Contrary to popular belief, wood is highly fire-resistant and its thermal conductivity is very low; wood transmits heat 12 times less quickly than concrete, 250 times less quickly than steel and 1,200 times less quickly than aluminium! The EPS used in TROIS DEVELOPPEMENT homes is of the fireproof variety and has an interior skin which acts as a fire barrier. It does not ignite and will not release gases during a fire. TROIS DEVELOPPEMENT houses are especially designed for construction in seismic zones. Thanks to their flexibility, the materials are able to absorb deformations without suffering damage. In terms of the foundations, steel screw piles (TECHNO PIEUX) provide excellent strength during earthquakes. It should be noted that our partner POPUP HOUSE obtained approval of its 1-storey construction system for seismic zones in French territory (zone 1 to 4) in “The New Technical Survey” carried out by SOCOTEC, a leading player in testing, inspection and certification. The construction process used by TROIS DEVELOPPEMENT was developed by a engineering and innovations office specialised in construction. Engineering expertise is applied to make its products adaptable and scalable. As such, the construction method is fully adaptable to the environment in which the house is located. In high wind areas the cross-bracing is reinforced, for example, and in mountainous areas the structure is consolidated to accommodate additional loads from snow. TROIS DEVELOPPEMENT’s wood constructions are protected against the possibility of rodent attacks by using anti-rodent meshes and by raising the house above the ground. With respect to insects, the entire wooden frames of TROIS DEVELOPPEMENT houses are soaked according to class 2. This protects against xylophagous insects including termites and lignivorous fungi.